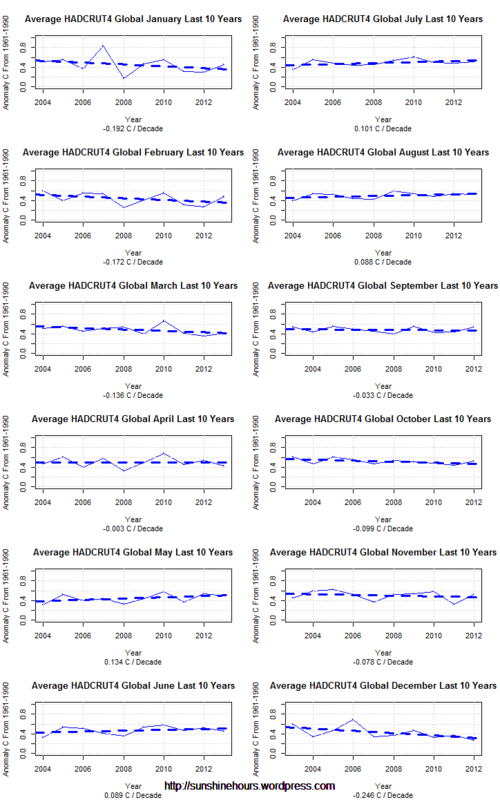 HADCRUT4 February 2014 – Global Warming? 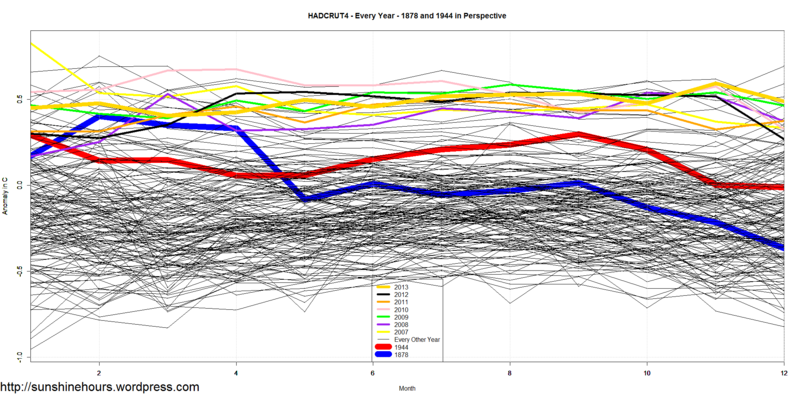 HadCRUT4 is a gridded dataset of global historical surface temperature anomalies relative to a 1961-1990 reference period. What Would 2C of Warming By 2036 Look Like? 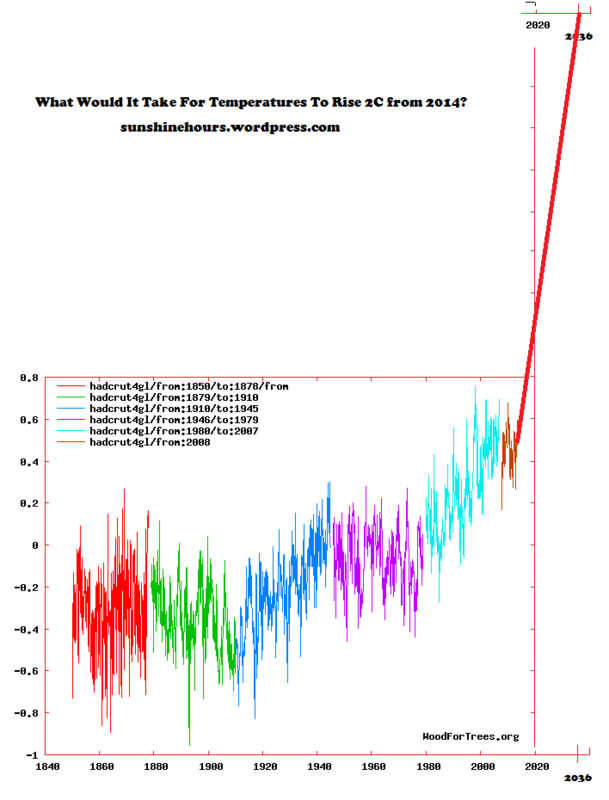 Using HADCRUT4 and WoodForTrees I graphed the data from 1850 t0 2014, and then added in 2C of warming by 2036. Update: The biggest rise over 22 years was March 1976 to February 1998 = 1.193C. The 4th biggest was March 1856 to February 1878 = 0.913C. 1878 to 1944 is 66 years. 1944 to 2010 is also 66 years. Let us put those peaks in temperature (using HADCRUT4 Global) in perspective. 1944 is red. 1878 is blue. Every year of HADCRUT4 is on the graph. The temperature is the anomaly from the 1961-1990 mean in Celsius. Click for bigger. Winter temperatures in the Northern Hemisphere are dropping as much as 2.5C / decade over the last 7 years. 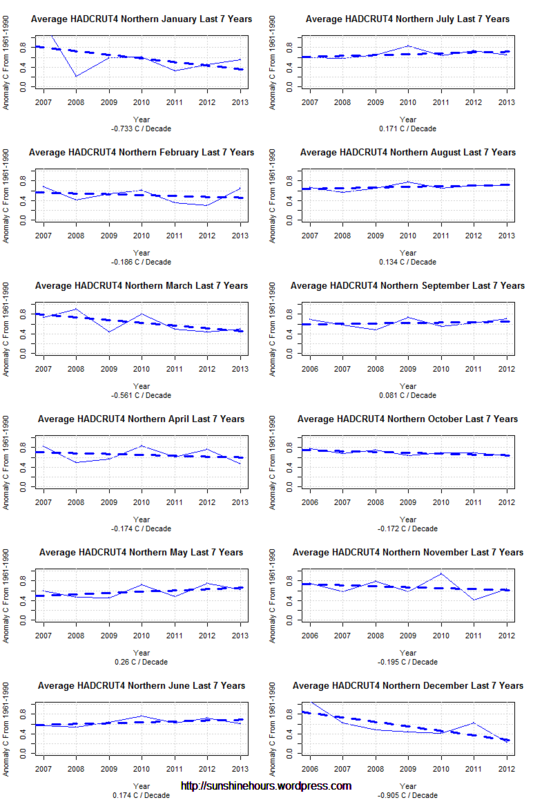 Yesterday my post was a look at the northern hemisphere by month over the last 7 years. 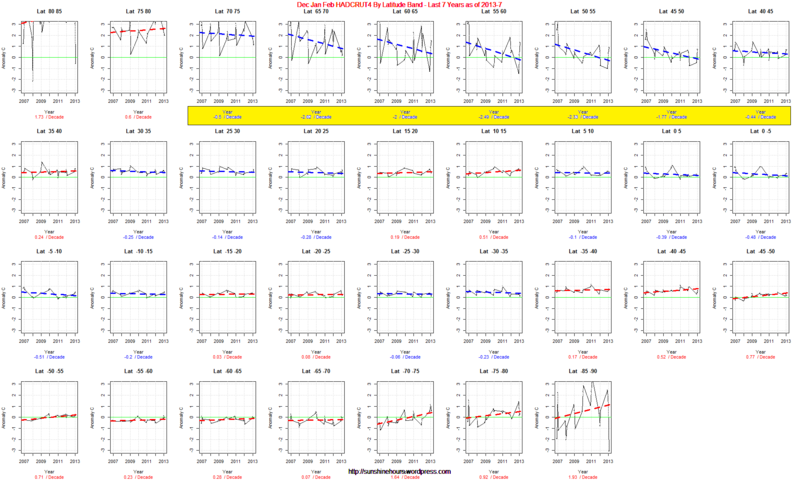 Today I am looking at the same time frame, but I am using the gridded HADCRUT4 data for Dec/Jan/Feb only. You will have to click on the image to get the full effect. There are 7 latitude bands with yellow highlighting. The trend in those is from -.44C/decade to -2.49C/decade. And note the green 0 line. 0 is the 1961-1990 average, Anywhere the graph or trend crosses the green line it is colder than the 1961-1990 average. It was pretty cold in the 60s and 70s. I wish I didn’t live in the 50th parallel. I’m glad I have a wood stove. Over the last 10 years HADCRUT4 has had a slightly negative trend. But the months each have their own trend. September to April have been cooling, while May – August have been warning, All 12 months with trends are below. I wonder why CO2 has forsaken the winter months? The interesting thing is this matches the AMO as you can see in the post I did in January. (I would do a new post but the US shutdown has shutdown the page I got the AMO data from). When the AMO finishes going negative this will be very bad news for the CO2/Warmist Cult.. And even worse news for the world’s agriculture. Right now, Dec/Jan/Feb are cooling at -0.17C/decade to -0.25C/decade. Brr. Germany is already off to the coldest start of winter in 200 years.